If there is any artist worthy of celebration in our contemporary American Idol Apocalypse, John Coltrane should serve as both antidote and inspiration. The question isn’t, really, about who might be interested in this documentary; it is about who might not be. For fans who already know everything, or those indifferent to jazz music altogether, this would not qualify as essential viewing. For everyone and anyone else, how on Earth could you pass up the opportunity to better understand one of the top-tier jazz geniuses of the last century—or any century? For those whose definition of genius is either too encompassing or excessively narrow, John Coltrane poses no problems: there isn’t anyone who knows anything about music (in general) and jazz (in particular) who would contest that he is among the most prominent, impressive and influential artists to ever master an instrument. Furthermore, to put Coltrane and his unsurpassed proficiency in its simplest perspective, it might be suggested that no one has ever done anything as well as Coltrane played the saxophone. Plus, he was an exceptionally gifted composer and bandleader and, by all accounts, he was a generous and gentle human being, as well. All of which is to say, if there is anyone worthy of celebration in our contemporary American Idol Apocalypse, Coltrane should serve as both antidote and inspiration. Coltrane’s prime years, the decade between 1957 and 1967, seem concise enough by typical human and even artistic standards. However, he recorded so much and went through so many profound changes, it's near impossible to convey the scope of his achievements—and impact—in a single documentary. It is, therefore, a severe limitation attempting to present any type of overview in 60-minutes, which is precisely what The World According to John Coltrane does. One wishes the original material (this reissue was initially released in 1990) could have been expanded, or at least embellished with additional concert footage. On the other hand, even an hour of Coltrane is, in a sense, overwhelming. Considering that consequential projects could be undertaken to address Coltrane’s years on the Prestige label (late ‘50s), his momentous collaborations with Miles Davis and Thelonious Monk, his years on the Atlantic label (early ‘60s) and especially his years on the Impulse! label up to, and after, A Love Supreme (in ’65), a 60-minute effort is at once ludicrous and, to be fair, probably necessary. 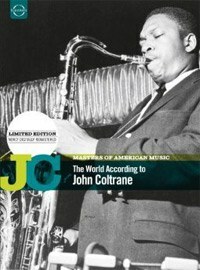 The World According to John Coltrane follows the obligatory chronological timeline, briefly passing through his youth (the influence of his deeply faithful mother and the church music that filled his childhood were significant sources of inspiration throughout his career), then his post-military dues paying on the live circuit. Several of his contemporaries, such as Jimmy Heath, Wayne Shorter, Roscoe Mitchell and Rashied Ali are interviewed, all lending insight and echoing the unanimous awe with which so many musicians regard Coltrane. Working in the first classic Miles Davis quintet while also recording his first sessions (for Prestige) as a leader, Coltrane steadily developed his fluid, exuberant style which famously came to be known as “sheets of sound”. The apotheosis of this evolution occurred in the miraculous year of 1959, which, among several other classic recordings, witnessed the releases of both Kind of Blue and Giant Steps. The footage, albeit awfully brief, of Miles’ solo casually sliding into Trane’s on “So What” is a bit more than simply historic: we didn’t get to see Notre Dame being built or The Statue of David being sculpted, but we do have the opportunity to witness some of the most brilliant musicians on the planet performing one of our best-loved albums. In the context of that seminal year, and this documentary, these are not simply all-time masterpieces so much as material that functioned as an obvious culmination of sorts as well as a point of departure (for both Davis and Coltrane). After Giant Steps Coltrane would expand upon the modal concept perfected on Kind of Blue and, along with a budding interest in Eastern cultures and the avant-garde, fully embrace what was coming to be called free jazz. After 1960, one can hear the imprint of Ornette Coleman alongside the harmonic algebra of Monk and Miles, all bubbling under the surface of an increasingly intense and emotional approach to songwriting (and soloing). Rashied Ali, who worked closely with Coltrane in the final years of his life, compares him to a competitive athlete: “He was like a fighter who warms up in the dressing room; he’d break a sweat (backstage)…he was always playing.” This combination of restless energy and relentless exploration led to concert experiences that were as exhausting for audiences as they were for the musicians. The sessions that produced My Favorite Things (1961)—a composition Trane would return to and reconfigure repeatedly in the ensuing years—are a touchstone for Coltrane’s next leap forward. Described in the documentary as a “hypnotic Eastern dervish dance”, this innocuous Rodgers/Hammerstein song became a springboard for an extensive, irresistible solo, showcasing Coltrane’s lucid yet multisyllabic way of conversing with his instrument. The footage of the “classic quartet” (McCoy Tyner on piano, Jimmy Garrison on bass and Elvin Jones on drums) tearing into this piece is more than worth the paltry price of admission. It is exhilarating to watch Coltrane—at his peak— in action, while the band steams in support. Literally. This particular clip was recorded in black-and-white at an outdoor festival, and throughout the performance it appears a smoke machine has been set up on stage until, after a while, it becomes apparent that actual waves of steam are pouring off Garrison and especially Jones. There is more footage, including the quartet augmented by the amazing Eric Dolphy—who collaborated and performed with Coltrane throughout 1960 and 1961—which is priceless and, considering how prematurely both these men left the world, more than a little heartbreaking. The highlight, however, has to be the full performance of Coltrane’s epic protest piece “Alabama”: what Coltrane accomplishes here could cause even the most cynical hater of humanity to feel humbled by the uniquely moving and profoundly positive force of musical expression. Of course, Coltrane’s music was not universally embraced during the final years he was able to record and play. His solos became longer and (much) more intense, yet no matter how many listeners he alienated, it was apparent that in order to push the audience, he first had to push himself. Roscoe Mitchell, commenting on this spiritual searching, likens Coltrane’s later music to what he witnessed in churches growing up, with people transporting into religious trances. This—the music and the explanation—is where more than a few draw the line; it’s just too out there. Coltrane knew where he was going, however, even if he could not quite define what he was looking for. His wife Alice remarks that Coltrane was following a “progression toward higher spiritual realization…and development.” That type of sentiment can, and perhaps should, make people wary (this being the ‘60s, etc.) but with Coltrane it was no pose, and this was no joke. Not for nothing is A Love Supreme considered one of the most important, and affecting, albums in all of jazz. And later, even amidst the sonic uproar, came majestic and tranquil offerings like “Dear Lord” and “To Be”. It was all over far too quickly. As is too often the case with our greatest artists, Coltrane fell ill and passed away long before his time should have come. It scarcely computes, even now, that the man making the music he recorded in early 1967 (particularly the shattering if cathartic Interstellar Space was months from losing a battle with cancer. Where he would have headed had he lived is truly difficult to imagine. It remains instructive, and more than a little startling, to consider the growth and refinement he demonstrated every few years, commencing in the mid-to-late ‘50s. Where he might have gone next is anyone’s guess, but it’s also safe to surmise that he took his instrument, and music, as far as anyone possibly could. The World According to John Coltrane is an anti-documentary of sorts in the sense that we don’t have scholars or critics opining on who the man was and what he meant. Rather, we have the crucial and illuminating insight of contemporaries reminiscing about what it was like to be there, and what it’s like now, having lived through it all. That, along with the invaluable footage of the music being performed, speaks more eloquently and appropriately than even the most well-meaning expert (or DVD review, for that matter) is capable of doing.